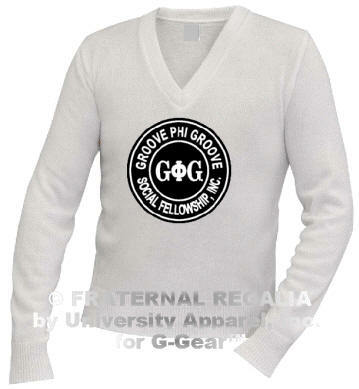 Groove Gear™ by University Apparel, Inc.
Prices include lettering specified. 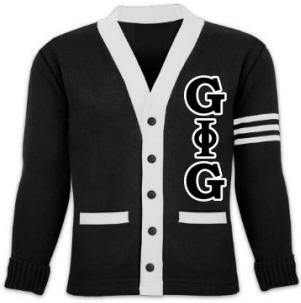 Personal information may be added to each jacket for an additional cost. 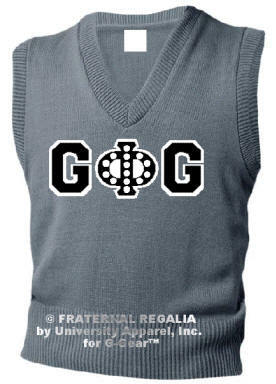 Custom orders are welcomed. 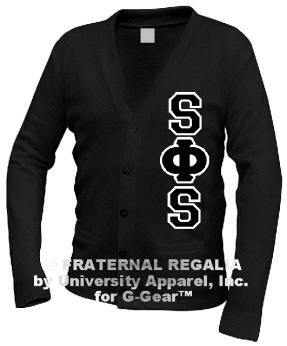 Please allow a minimum of 4-6 weeks for production and shipment of solid acrylic cardigans. 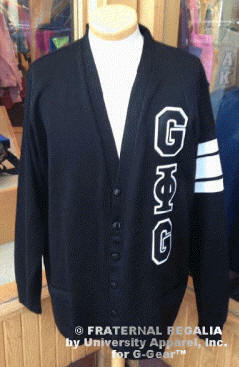 Varsity Cardigan and V-neck Sweaters are individually knitted. Production times are a minimum of 8-12 weeks. 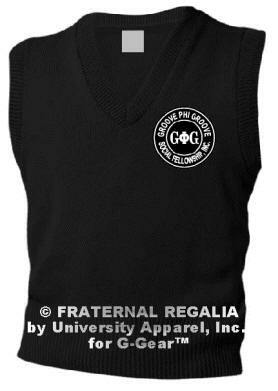 Add Twill Half-Sleeve Stripes at an additional cost of $20.00. Pattern 1 includes up to four 1-inch stripes (same color). Pattern 2 includes two 1-inch stripes with a 2-inch stripe in the middle (same color). Alternate colors for +$5.00. 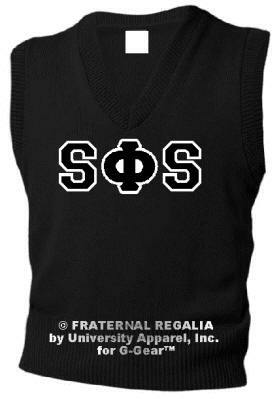 note: letters and small symbol all on left also available. 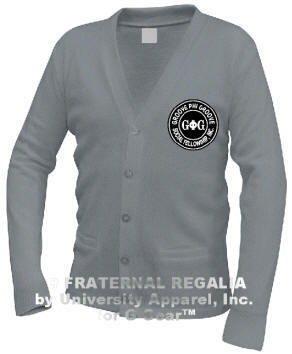 100% 3-ply acrylic 5 button-front classic v-neck cardigan with contrasting trim on placket and pocket welt. 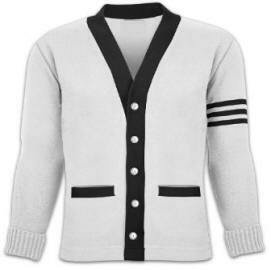 Indicate Unisex buttons (left over right) or Ladies buttons (right over left). Allow 6-9 weeks for production. 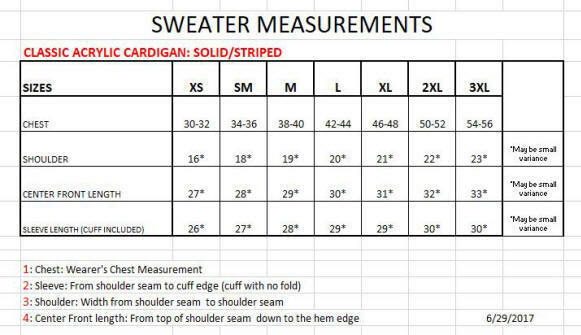 Choose body color, placket color, pocket welt color, and stripe color. For more information about this website, please contact the webmaster. The items shown on this website are not marketed nor offered for sale as ready-made or in-stock retail items for any specific organization, unless specified as such. 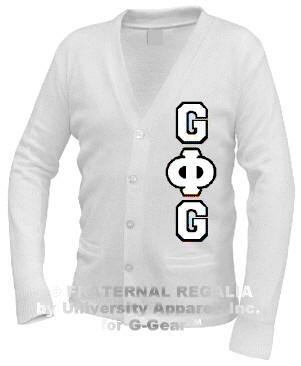 Photos are shown as examples of the work that may have been done in the past and/or that may be made for your particular fraternal organization. Copyright © 1997-2018 [G-Gear/Groove Gear and University Apparel]. All rights reserved. 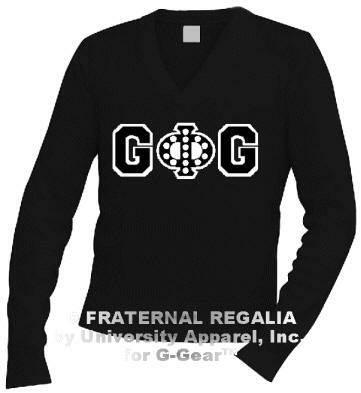 Greek and Non-Greek letters, name, or insignia of particular fraternal organizations are not necessarily being sold under a license or other sponsorship from those organizations. 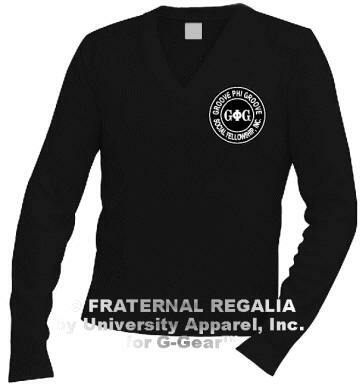 It is the product manufacturers' intent that sales be only to and/or for members or pledges of the represented fraternal organizations. "Special order purchases from local vendors are tantamount to a consent to use agreement or a limited license..."
Providing the best Groove Phi Groove® Gear and Paraphernalia items, since 1988.